Hello and welcome to my Release In Review post for the December Papertrey Ink Release! The new products you are seeing here will be available in the store at Papertrey Ink on December 15th at 10:00 EST! My first card is using Maile's newest Splits: True Love along with the new Thick & Thin: Hello dies. These dies are really very clever! I love the many different looks you can get with them! I also used the Fancy Foliage Details dies to cut out a few leaves to tuck in. 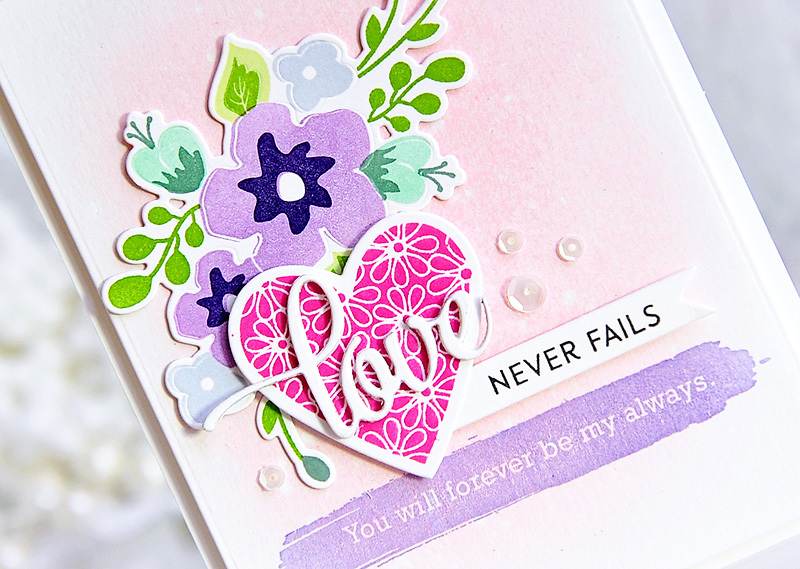 For the flowers, I embossed them with white embossing powder, and blended Lilac Grace and Lovely Lady die ink over top. 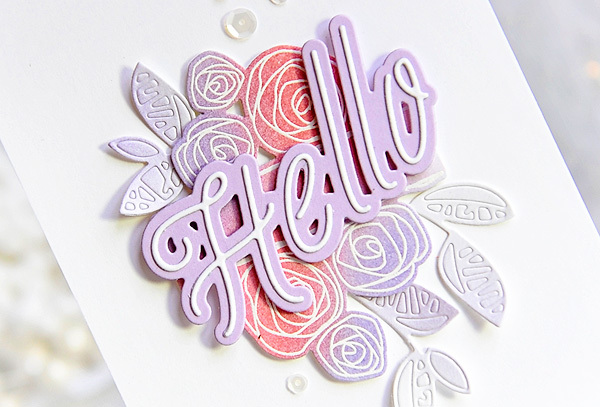 The back part of the Hello was cut out of Lilac Grace Card stock, and the inner lines Stamper's Select white. Everything was mounted to a white card base with foam tape. I also added a few white sequins to finish it up! My next card features the new She Moves stamp set and matching dies. I sponged some Raspberry Fizz ink onto my background, and then cut a piece of white card stock at an angle and glued it over top. I added a small strip of Amethyst Allure striped paper along the bottom, and stamped the sentiment from Making Strides in True Black. 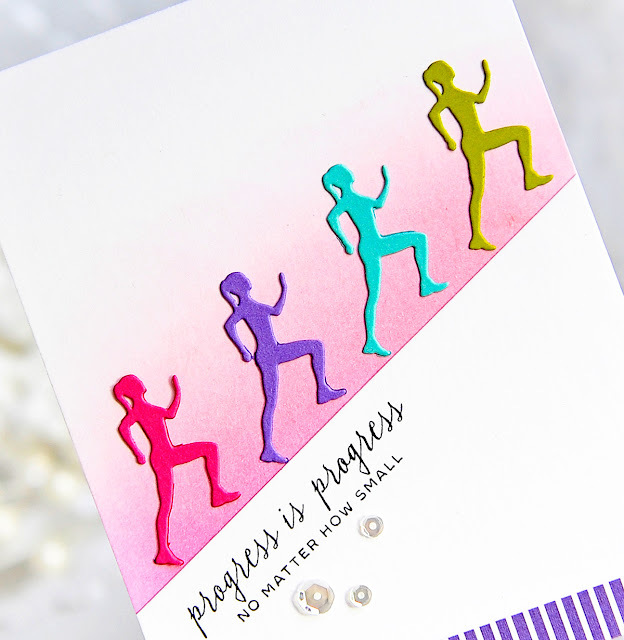 I cut the running girls out of different colored card stocks, and glued them along the diagonal edge of the card stock. So this pretty is going to my niece who is getting married this coming Sunday! Such perfect timing on a wedding set :) I'm taking the pictures for the wedding too. It's going to be a small wedding ( I'm so glad) No pressure right? Eek! Okay on to the card! I blended the background with Hawaiian Shores and New Leaf ink, then sprinkled a little water on top for the white spots. I then stamped the cat tails, water, little lily pads, and sentiment. 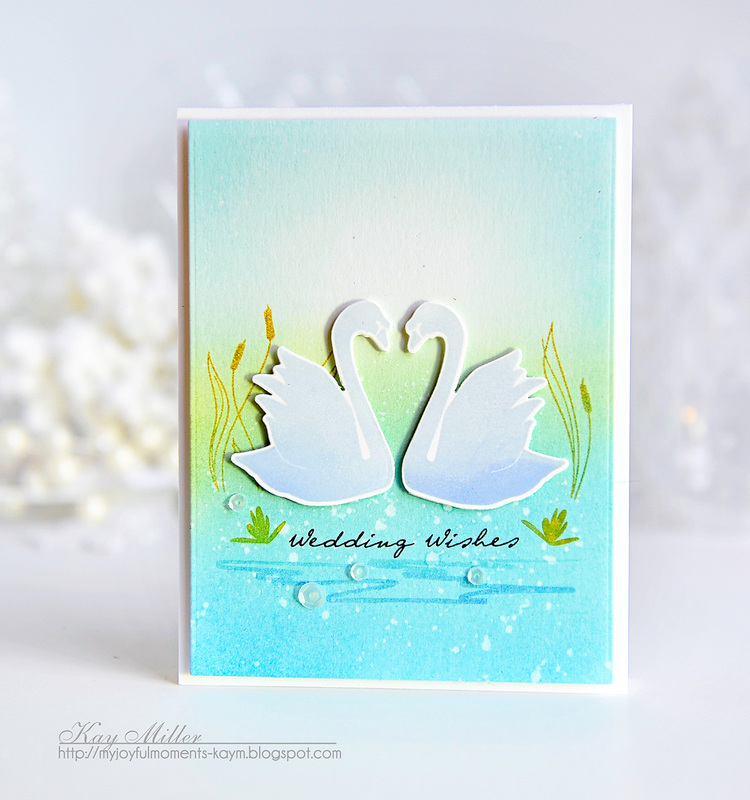 I stamped the swans in Spring Rain, cut them out with the die, and added them with foam tape. So then there is this one. 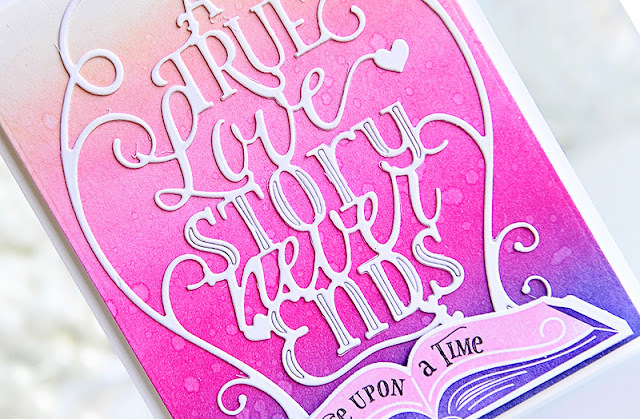 I combined Betsy's newest Inspired: Love stamp set and die, with Nichole's new Stroke Speak, which has some wonderful sentiments in it. 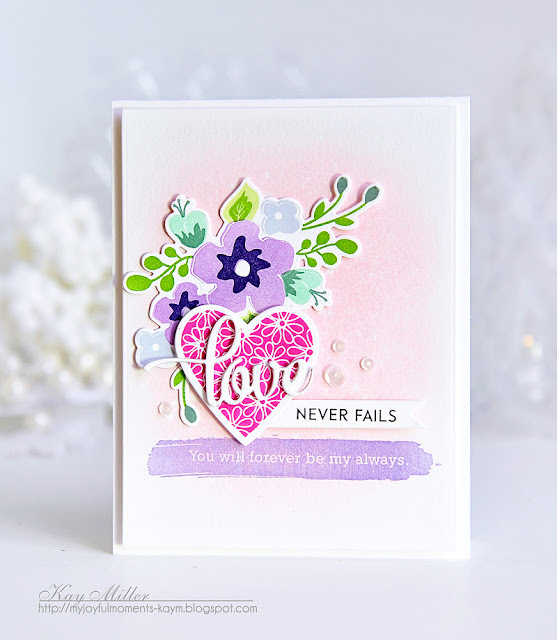 I blended some Pale Peony for the background, and I used the flower stamps and dies from the Don't Forget To Write Make it Market kit. The heart is from an older set called Heart Prints. I layered and adhered everything with foam tape. The sentiment from Stroke Speak was stamped with Amethyst Allure directly onto my background. 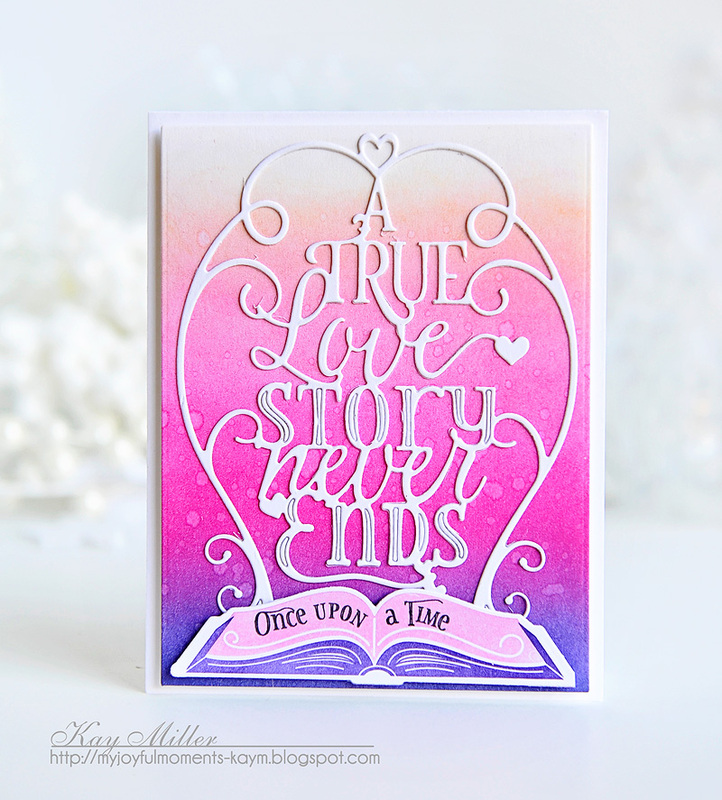 And then for the finale I have this colorful creation made with Betsy's new Paperclippings: Love Story. The background is blended with Distress inks, Chipped Saphire, Worn Lipstick, and Tattered Rose, a really pretty combination. I cut the Paper Clippings die out of white card stock, and glued that down to my blended piece. I then stamped the book with sentiment, cut it out with the dies, and adhered it with foam tape. And that was all it needed I thought! Thank you all so much for stopping by my blog during the Papertrey Ink release countdown and thank you ever so much for the sweet comments you leave along the way! They are read and appreciated more than you know! For more inspiration check out these talented girls! 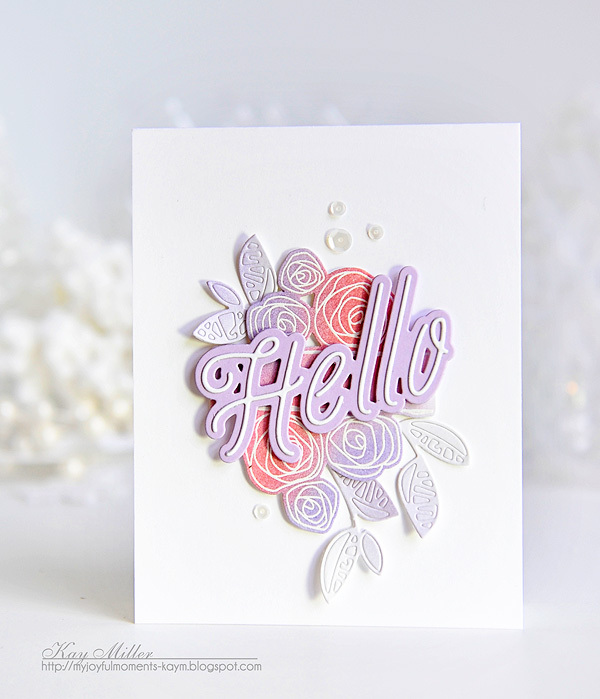 Love this beautiful array of cards, but you definitely had me at "hello" (the first card)! You do such a fabulous job with a wide array of supplies, Kay. Uber talented is what you are! Thanks so much for all the hard work that goes into getting a post like this ready! Lots of creating, photographing and typing. I, for one, sure appreciate your dedication! And the eye candy! :) Big hugs!! 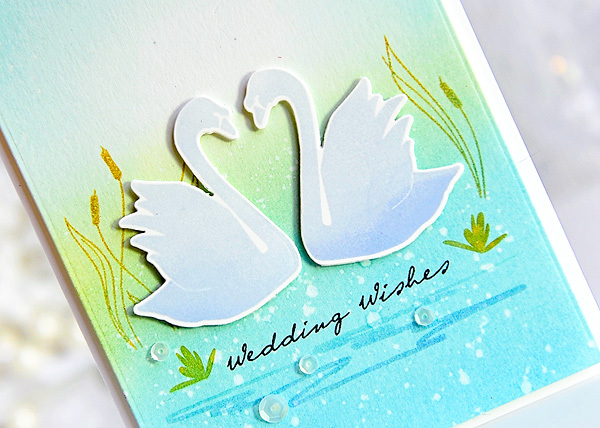 The swan and the love never fails cards are my favourite. And the swan takes it by a nose. It's divine and sublime. Have fun at the wedding, don't stress about the photos, but make sure you take at least one pic of the bride full length in her dress (ask me how I know). Gorgeous gorgeous inked backgrounds. I fall in love with everyone of your beauties from backgrounds to foregrounds! Have a wonderful time at the wedding. Wow, that a lot of beauty on one page! Love your designs and how you use color - just gorgeous! The wedding card is so lovely! Gorgeous collection of cards in beautiful color, Kay!! have a great time at your niece's wedding! Congratulations to your niece and her husband to be! Absolutely gorgeous cards, Kay! I love how you added your Fancy Foliage dies on the first card, and how you inked the background on all of your cards...so striking and so incredibly beautiful! Enjoy your niece's wedding...I'm sure your photographs are going to turn out beautifully, Kay!!! So many pretty cards Kay!! I love what you've done with the swans!! Beautiful projects as always, Kay! PTI is so lucky to have you on their team! And I'm smitten with the finale--colorful gorgeousness in "Kay" colors!